2339 (Plymouth & Mount Batten) Squadron have held their Presentation Evening to celebrate the achievements of cadets. The event was held at Plymouth's Royal Duke of Cornwall Hotel, with guests of honor including the Deputy Lord Lieutenant of Devon and Wing Commander Tom Walker from Defence Equipment & Support. The formal evening saw Flight Lieutenant Mike Willis being presented with a new trophy by the Deputy Lord Lieutenant which is to be known as the Willis Trophy and will be presented to the cadet which has made an outstanding contribution to the Squadron. 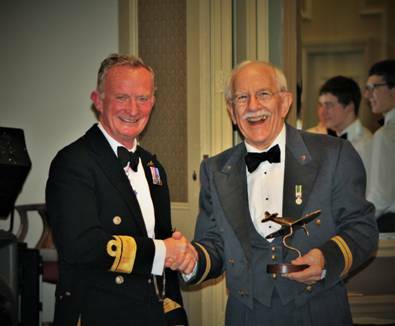 Flt Lt Willis, who at 82 years young is now serving as a Civilian Instructor since he retired from his commission. 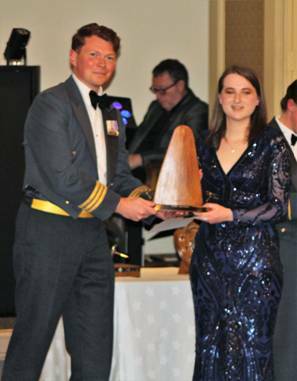 Wing Commander Walker made presentation including the Best Flight Award which was received by the Flight Commander of Merlin Flight, Cadet Flight Sergeant Emily Wilson. The Best Cadet NCO Award was presented to Cadet Corporal Nathan Cooke who was then promoted to Cadet Sergeant together with Cadet Sergeant Aiden Smith. Other promotions included Cadets Georgia Booth, Dexta Coultas, Joshua Gardner, Ollie Kenny and Harrison Thompson-Byrne who all were promoted to Cadet Corporal. Staff were not without promotions as the Squadron Commander Pilot Officer Amanda Gardner and Sergeant Steven Hancock were promoted to Flying Officer and Flight Sergeant respectively. Other awards presented on the night include Best Cadet, Best recruit, most improved cadet, Warrant Officer Award. Along with a number of classification certificates, DoE Awards, First Aid certificates.